Reckless driving accounts for thousands of accidents, injuries, and fatalities each year. Not only are the physical consequences severe, but the legal consequences are just as serious. You can expect to see much higher penalties associated with a reckless driving ticket when compared to just a normal traffic ticket. Depending on what state you’re in, you’ll see different laws associated with reckless driving, and something that constitutes safe driving in one state may actually be reckless driving in another. If you do happen to receive a ticket for reckless driving, you will have a court date to attend where you will stand in front of a judge who will decide if you are charged or not. If you are determined guilty, you will see a misdemeanor on your permanent criminal record. At the very least, you will have a ticket and will need to attend traffic school. In serious cases, you may even be sent to your county jail. One last thing that you should expect is a rise in your car insurance rates when your insurance provider finds out. Reckless driving is defined as driving with no regard for the safety of yourself or others. Reckless drivers do not make safety a priority and are showing they are not considering the consequences of their driving. If someone gets a reckless driving ticket, it’s because they had regard for the rules of the road and are at a higher risk of getting into an accident and causing both property damage and injuries to themselves or others. However, in order to get a reckless driving ticket, a driver has to be doing something more than just showing carelessness. In a majority of states, certain laws do not allow drivers to drive in a way that demonstrates willful disregard for others on the road and passengers of the vehicle. Pedestrians are also in danger when one is driving recklessly. 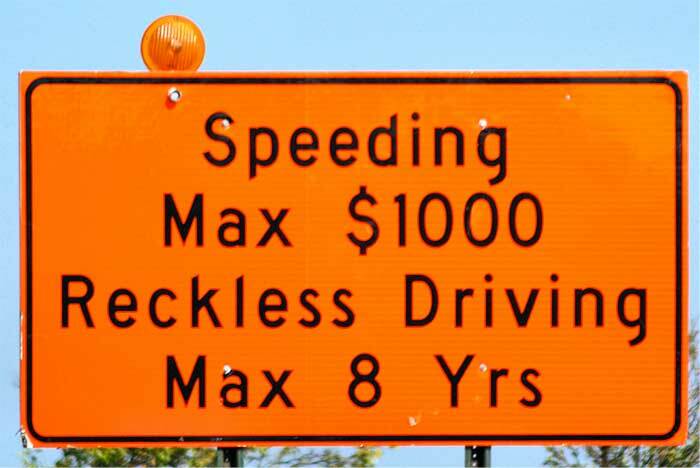 Again, many states will have different rules when it comes to identifying reckless driving. It can often be referred to as reckless driving or dangerous driving, but the same type of driving is being referred to, in any case. Passing a vehicle on a two lane road when there is limited visibility ahead. Driving above 25mph over the speed limit. Running from a police vehicle. You should know that receiving a ticket does not automatically deem you guilty. Like any other ticket, you will have the option to fight it in court. If you are actually found guilty, this very severe offense will appear on your permanent record. Are you a person who constantly finds yourself engaging in reckless driving? If so, it may benefit you to take a traffic school course such as defensive driving. Although many people take these classes after they receive a ticket, they can be very effective at helping you prevent the violation in the first place. You will learn many valuable driving techniques that will keep you, your passengers, and others safe on the road. Another benefit of a traffic school course is that your insurance provider may provide a discount on your premium for completing one. For more information, talk to your local court. The classes are offered in the classroom and sometimes online, depending on your location.